It is a given fact that if you are a new parent and want to take your child out, you have a ton of things to carry with you. Back in the day, the only options we had were those diaper bags that looked boring since they lacked various colors or style. Thankfully, we have gone a step further today, and diaper bags have become not only stylish but also multi-functional. A diaper bag is a must-have, and the best convertible diaper bag will greatly benefit any parent. Since most of us are very conscious about what we wear and the accessories we carry, manufacturers have also become very aware of producing trendy diaper bags. Gone are those days where these bags only had one shape and few color choices. Today, diaper bags are basically unrecognizable. They comfortably transition as a regular backpack too. There are a variety of colors and designs to choose from as well. In this article, we are discussing three of the best convertible diaper bags. Each of these bags is stylish and has a ton of features that you will find a blessing in disguise when you step out with your child. If you have used a diaper bag previously, then we are certain you have heard of the Hip Cub. This diaper bag backpack is their latest addition to the Hip Cub family. Right from the get-go, this bag offers you a ton of choices. You will find that this diaper bag effortlessly transitions from a classic messenger tote to a stylish looking diaper backpack. Speaking about the design, it was made keeping in mind both women and men. The design is unisexual and comes in colors that are neutral and everyone’s favorite. There are two color options; white and black stripes and white and navy blue stripes. Both have brown leather detailing as well. Now heading to the most important aspect of the bag, the space it offers within. You can be certain that your bag will be organized at all times—thanks to the ten secure pockets they have. Hence, they market this product as the most multi-functional yet stylish and organized bag. All in all, there are two secure zipper compartments in the front (one large and one small); five very spacious compartments within; two pockets on each side of the bag. To top it off, a pocket at the back of the bag is also present which fits the matching changing pad given by Hip Cub. Along with the matching changing pad, the company also offers a set of universal stroller straps. These are complementary and they exactly match the brown leather detail on the bag. Best of it all, this entire bag is water resistant. The product comes with a 90-day warranty period. 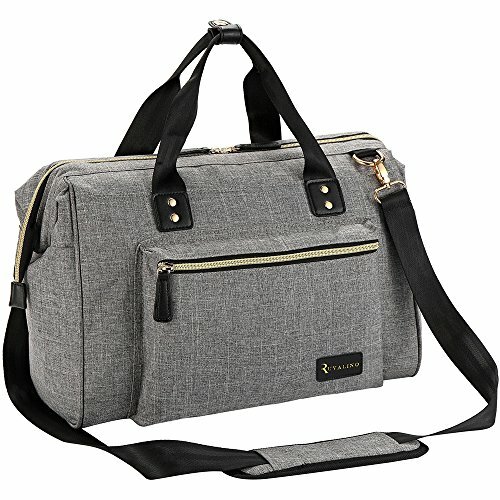 If you need a diaper bag that has a modern chic style and can easily convert into a travel bag, then the Diaper Bag, RUVALINO Large Diaper Tote Stylish for Mom and Dad Convertible Travel Baby Bag for Boys and Girls with Changing Pad, Insulated Pockets (Grey) is what you need. One of the main reasons why this bag is so popular is because it has a unisexual design and resembles a high-fashion travel bag but with a ton of features. This bag goes well with moms and dads. What is better is that no one will be able to figure that this is a diaper bag. The product is available only in color dark gray and has black details all over. It is very light in weight, made from a sturdy material and its dimensions are 15 x 6.3 x 11.8 inches. The reason why we like this bag is that it can be carried in three different ways. It is not just a diaper tote but also works as an across-the-shoulder bag with a strap. If that isn’t enough, all you need to do is clip it on the stroller or your luggage and travel with it. Space-wise, there is a ton in the bag. It can hold all of your baby’s essentials without making the inside look like a mess. Everything within is very neat and organized along with insulated pockets to keep the bottle warm. In addition, you will also get a complimentary changing mat. Also, the rectangular design helps this bag in sitting upright. This bag comes along with a one-year warranty period and a 90-day money-back guarantee. The material, though sturdy, can be a little hard. 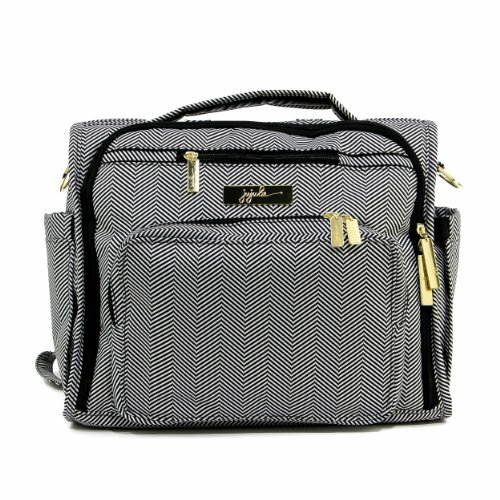 Resembling a rectangular backpack, the Ju-Ju-Be Diaper Bag is perfect for those who like a simple and classic design with a lot of features. To begin with, this bag is made from a 100% polyester material and can be washed in the machine. To dry the product, all you need to do is expose it to air. The outer fabric of this bag is treated with Teflon so that no stains will stick to it. Also, the Agion treatment helps in protecting the inside lining of the bag by prohibiting the growth of bacteria that causes odor, mildew, and mold. All the hardware on this bag is made from metal for it to last long. There is a ton of space within and is all very well organized. There are four pockets within, three additional zipper pockets on the exterior side, and 3M insulated pockets. Also, there is one last pocket outside for quick access to your phone, keys, wallets and the likes. The bag comes with a lifetime warranty against manufacturer defects. 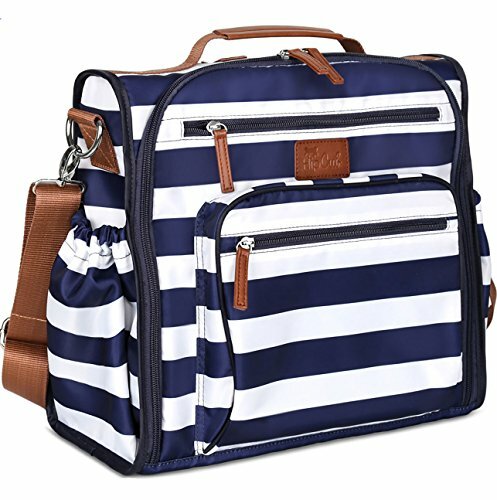 Mentioned above are three of the best convertible diaper bags that can be used by moms and dads. Hence, each of them is fantastic. However, if we had to choose one, then it is got to be the Hip Cub Diaper Bag Backpack. That is because there are multiple ways to carry this bag and it comes in a perfect shape and size with two very classic colors and designs. Moreover, the bag has a ton of features that are super handy when you are stepping out with your child.